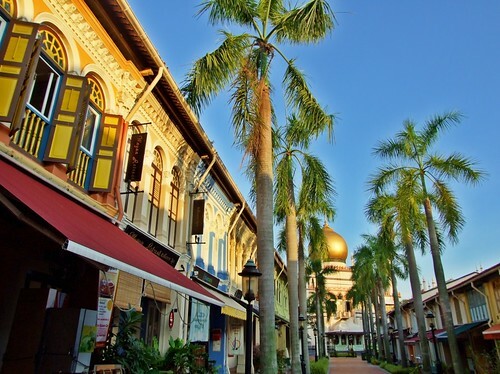 Singapore is a city-state on the southernmost tip of the Malay Peninsula. For many years it was a British colony until independence in 1963 when it merged with other local states to form Malaysia‏‎. However, two years later it seceded from Malaysia and became independent. On independence Singapore made a decision to choose English‏‎ for day to day life and this decision is credited with helping the country become the economic and cultural center it is. Increasingly it is developing its language facilities and hopes to become the premier hub of English language learning in Asia. It is a highly Westernized state and perhaps the most advanced in SE Asia. It has a population of 5 million, many of whom speak and understand English. The ethnic majority is Chinese. The city is built around business and thus Business English‏‎ is much in demand. Although some jobs are advertised on the internet, many people find work by actually being in the country and cold calling schools and businesses. One useful resource for finding work is the online Straits Times classified section which includes many advertisements for more traditional English teaching – often for the British O and A level examinations. Most schools require a degree which is needed to get the necessary employment permit. There are few exceptions to this rule, notably if you have a job offer of more than 7,000 SGD or $5500 USD (€4352, £3500) per month which is very unlikely at a school. As well as a degree to work at any decent school you will also need a TEFL Certificate and at least a year’s experience. On that note experience counts for a great deal and the more you have, the easier you will find it to get a good job. Pay varies, but a decent job will give around 3,700 SGD or $2900 USD (€2295, £1845) per month which will provide a very comfortable lifestyle. Less qualified teachers will receive less. However, if you are teaching to businesses or privately, you may be able to find work without experience. Pay here can be about 60 SGD or $47 USD (€37, £30) per hour. Split shifts are common and you may need to work on Sundays. Since English is the language used in state schools, most students tend to be older. It is not untypical to teach a multilingual class of adults from several countries in SE Asia. On such a small, highly populated island accommodation is inevitably expensive. Mostly it will be in one of the blocks of flats which are generally either HDB (something like public housing) and high quality condominiums which may include swimming pools, gyms and so on. HDBs are cheaper and sometimes without many facilities including air conditioning. Prices start at around 750 SGD or $600 USD (€475, £382) per month with condos starting around 1,500 SGD or or $1200 USD (€950, £764) per month. The city is vibrant. It is expensive to live there but eating out can still be done very cheaply in one of the many incredible food courts. Generally it is a safe city with relatively few drug related problems. Perhaps best avoided, however, is the red light district along the Geylong Road. There are two main seasons: wet and dry. Every day is hot, however, and most schools are air conditioned. Dear sir I wish to inform you that I am deeply and highly delighted to serve as a teacher .I have been teaching since 2007. It’s always nice to hear from dedicated teachers. 🙂 Happy teaching!